I’m not trying to toot my own horn, but I have a pretty mean jab. I’m not saying I could go all Chuck Norris on anybody in a fight (don’t try me, though), but weekly kickboxing classes have made a sistah feel pretty confident. Still, I’ve always wanted to have a go at real boxing. I didn’t see myself going around a ring practicing my footwork, bobbing and weaving and all of that jazz, but I did want to have a go at a punching bag. So how does a gal like me get into boxing when I’m such a novice to it all? The trick is to ease into it while doing so in an environment that is both comfortable and relaxing at the same time. It’s about yin and yang. With that being said, get to know Box + Flow. I checked out a class earlier this week after Box + Flow partnered with Instrata Lifestyle Residences to offer residents in the area the class. It took place in downtown New York’s NOHO neighborhood where the small studio stands on a quiet cobblestone street. On the stairs leading up to the space are inspiring words meant to get you motivated, and once you enter, it’s time to get down to business. 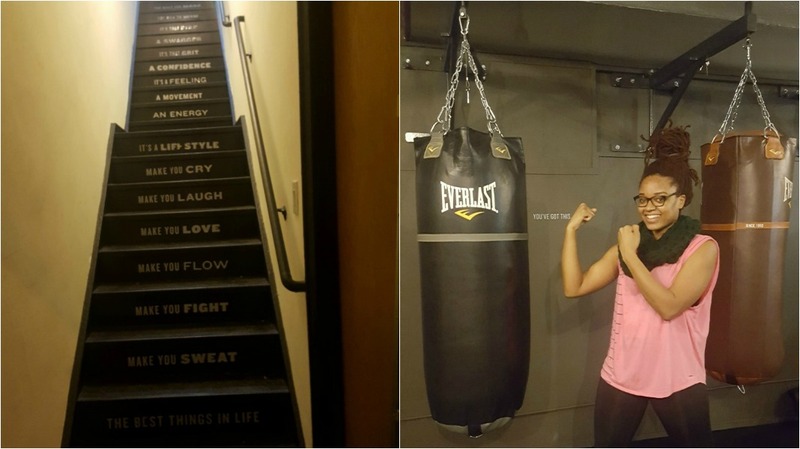 On the ground lay multiple yoga mats, while against a wall hang a bevvy of heavy Everlast punching bags. On the wall reads more encouraging messages, including “Flow thru the fight” and “Fight thru the flow.” After removing your shoes and socks, you’re given a pair of wraps and boxing gloves, and before you know it, it’s on. We started the 50-minute class with shadowboxing. 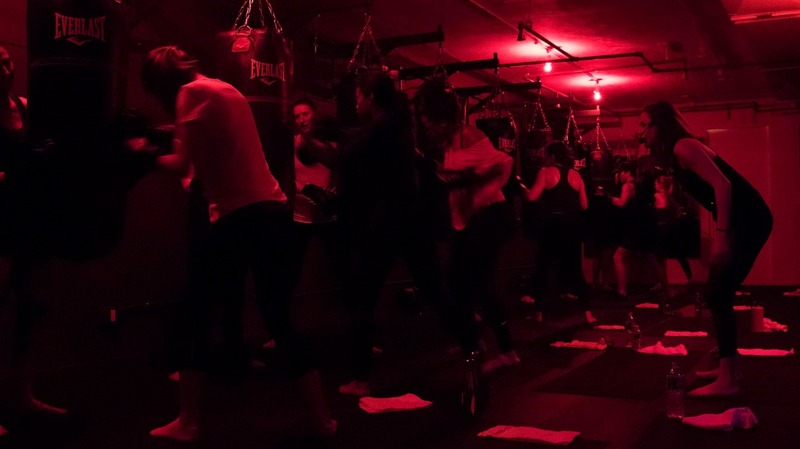 Soon after, we landed a flurry of punches on the bags, and after a rough commute, I was more than happy to pretend I was Muhammad Ali for a little while to unpack the day’s hostility. But little did I know that being asked to land hard punches for 30 seconds, as well as fast ones and even teaming up with partners would leave me drenched in sweat so soon. It took no time for my heart rate to jump and for me to feel like I was overexerting myself, but that’s where the flow part comes in to help you cool off. After 30 minutes of going hard on the bag, you eventually get down on the floor and change your focus to yoga. You literally move into a whole host of poses, including downward dog, child’s pose, boat, bow and other Ashtanga essentials in an effort to cool the body down and relax yourself. The contrast between intense cardio mixed with yoga, which helps you to gain strength and tone, is a dream come true for fitness enthusiasts. Not to mention that the music contrast is also pretty awesome. One minute you hear Rick Ross while going at the bag, and the next you’re listening to folks singing over acoustic guitar while trying to hold the wheel pose. It’s everything you never knew your mind and body needed. But the best part of the entire class is the support you get from not just the instructor, but also from other participants. At one point I was told “You killed that!” after doing the absolute most on a punching bag from a fellow newbie, and later I found myself feeling very special after the instructor gave me a mini shoulder massage when I came down from a plank into chaturanga. Talk about perks! If you’re interested in trying your hand at this one-of-a-kind workout, a single class goes for $33. There is currently a one-class intro deal for $20, a three-class intro deal available for $84, and a pack of five classes for $145. There are even options where you can rent the space and do private sessions if you’re really trying to train to get your Laila Ali on. Packages include a pretty sweet Box + Flow tank if it takes a T-shirt to sway you. All in all, the class is worth a shot, especially if you want to diversify your workouts in unique ways — or if you simply like the feeling of waking up with your entire body sore. Feel the burn, sis.